Fine Tubes has the engineering expertise to control tube dimensions down to just ¼ the diameter of a human hair. Our tubes are deployed in the fuel cans of advanced gas-cooled reactors where they endure temperatures of 650°C, without fail, for five years non-stop. V. K. Rubplast (I) Pvt. Ltd.
Ratnadeep Metal And Tubes Ltd.
GE Hitachi Nuclear Energy is committed to integrating our fuel cycle offerings. GE Hitachi Nuclear Energy's fuel cycle business offers high performing and reliable nuclear fuel products, uranium services, enrichment services, and fuel recycling solutions. We offer Walking Beam and Pusher Furnaces for nuclear fuel sintering. Our service range includes nuclear piping for the nuclear reactors in the nuclear power plant. We are engaged in various piping and allied works related in the nuclear systems. 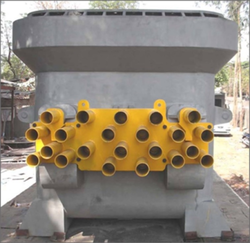 Prasanna Engineers also offers service for replacement of Feeder Piping of Reactor. Engaged in manufacturing and supplying products like fuel tubes.